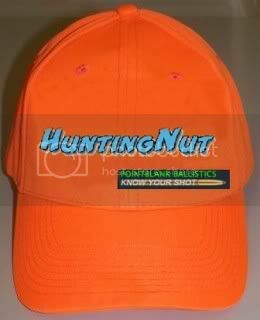 White or Safety Orange .... "Hunting Nut" in the same font/styling as the website but in black (on the orange) or Blue (on the white) and on the back "Point Blank" about 3/4 the size of the "Hunting Nut" with a bullet and a trail as a line with a small target on right side where the bullet is leading to. Don't forget one of the little smiley guys. Hunter's name one the back. Well there can be the none personalized one too. I like the idea. But how about putting the Pointblank around the side or over the band in the back. If you can get this off the ground by Christmas that would solve a lot of problems for me I like the idea of camo, but please to the heavens above don't do the fashion colors (pink, blue, purple camo) or the "new" military digital camo, it just don't look right. Great idea Dallan- I was thinking the same thing myself and I'll be I aint alone. Didn't wanna be a buttinski though. And- got me a nice vest, $12.99. Three game pockets, 4 ammo pockets with many shell holders, shoulders are quilted for recoil. And man, it is ORANGE. I'm not much of a slave to fashion but I'd be all over the Huntingnut Brand. With pride! Ah- I take it back. You know the drill. Them dove's smart if they clip ya just right. I like the comer's and if ya pop 'em just right and don't make 'em flare ya hardly need to walk to recover 'em.